These five destinations let you live the Italian dream: crisp white wine by the pool, fresh-made pasta for dinner, shopping excursions and hikes along ancient trails. Plus: delicious recipes to bring the experience home. Photo © Gaelle Le Boulicaut. Backstory: Two decades ago, a fire destroyed this 300-year-old villa in Treia, a four-hour drive east from Florence. The story goes that the farmer who lived there, Oscar Olivi, jumped out a window, broke his leg and never returned. Design: Swiss architects Markus Wespi and Jérôme de Meuron spent four years restoring the gorgeous stone building. Inside, it’s white-washed and wood-beamed, with five spacious bedrooms. American-Style Kitchen: “I wanted to be able to prepare risotto while guests are having a glass of wine next to me,” says one of Olivi’s owners, who spends holidays at the villa, “so we went for an American-style kitchen that opens onto the dining room.” The space is outfitted with professional-grade equipment from the Italian company ArcLinea. Grilling With a View: An outdoor kitchen on the terra-cotta terrace has a new stainless steel grill and teppanyaki (Japanese griddle), plus thrilling views of the olive groves all around. Local Wine & Cooking Guides: In Treia, sommeliers Amy Wadman (an American who has lived in Italy for more than 20 years) and her fiancé, Mirco Lucamarini (a Marche native and owner of nearby restaurant Casolare dei Segreti), are available to lead winery visits, give cooking classes and help stock Casa Olivi’s deep wine cellar. Swim & Sushi: The Monte Conero Coast, a half-hour away, is a great spot for a swim and a breakfast of “Italian sushi” (crudo) at Michelin-starred chef Moreno Cedroni’s Clandestino. Photo courtesy of Podere Palazzo. Backstory: When Chicago-based designer Patrizio Fradiani bought this 18th-century house, it had been abandoned since the early 1950s. Before tearing down the crumbling building, he meticulously photographed and studied it so he could rebuild, using original and locally sourced materials. Design: All of the stonework is recycled; the reclaimed handmade floor tiles are from a 400-year-old mill nearby. For contrast, there’s modernist furniture, minimalist Donald Judd–like art and an infinity pool. Al Fresco Pizza: Guests gather large stones to use for baking pizzas in the outdoor oven. They can eat every meal outside around a huge travertine-topped table, listening to the rumble of wild boar roaming the grounds. Learning To Make Pasta: When the owners of the nearby Michelin-starred La Parolina outgrew their tiny restaurant, they called on Fradiani to design a new space with a demonstration kitchen. Guests at Podere Palazzo can take special classes there on topics like chocolate or pasta-making. Incredible Hiking & Boating: A portion of the Via Francigena, an ancient trail that pilgrims followed to Rome, is a few minutes’ drive from the villa. Guests can also explore the islands of Martana and Bisentina in Lake Bolsena by boat and swim in the astonishingly clear volcanic water. Photo courtesy of Villa Pizzorusso. Backstory: A Puglian stone masseria (fortified farmhouse) 10 miles from Brindisi, Villa Pizzorusso dates back to the 1500s. That makes it new by local standards: The archeological ruins in the nearby town of Matera, where houses and churches are built into cliffs, are thought to be from the Paleolithic era—making the town older than Jerusalem. Design: The villa’s Moorish and neoclassical style includes grand arches, colorful floor tiles and original frescoes on the bedroom ceilings. During recent renovations, workers discovered a secret wine cellar, accessible through a trap door in the foyer floor. 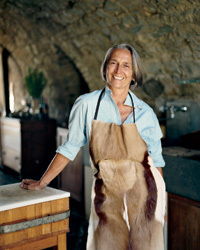 Cooking Options: The 500-year-old wood-fired oven (large enough to fit a whole goat from butcher Dario Baldari) is the centerpiece for big dinners under the pergola. Guests can also pick ingredients from the enormous vegetable and herb garden or from the fruit trees around the property, which produce quince, persimmons and mulberries. Foraging Mentor: When in season, mushroom forager Giuseppe Lolli leads truffle-hunting excursions. Must-Buy Wines: Located near Mesagne’s historic center is the terrific wine shop Cantine Due Palme, which sells full-bodied Serre made from an ancient red-grape variety called Susumaniello, found only in Puglia. 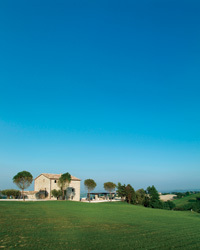 Sleeps 12; from $5,000 per week; villapizzorusso.com. —MM Photo courtesy of Ca Montanari. Backstory: Since 2002, Mattia Montanari and his family have been making exceptional Lambrusco, Emilia-Romagna’s signature sparkling red wine, in a town outside Modena. But, unusually for the region, they farm the vineyards organically—working, one might say, in harmony with the earth. That idea of harmony extends to the name Opera 02 di Cà Montanari, given to the winery, balsamic-vinegar operation and contemporary agriturismo (farmhouse inn), where each of the eight rooms has its own terrace. Pool With A View: From the long infinity pool at the base of the winery, guests can look out onto rolling hills of vineyards, where the Montanaris grow two varieties of Lambrusco grapes: Grasparossa and Salamino. Lambrusco-Perfect Food: The stylish dining room turns out traditional Emilia-Romagna dishes that pair beautifully with Lambrusco, like puffy fried gnocco fritto and tortellini in brodo (broth). Chef Silvana Baranzoni tops risotto with Montanari’s own balsamico. Backstory: In 2006, the municipality of Venice requested bids for a project to make use of an abandoned vineyard and estate on the teeny, dreamy island of Mazzorbo. Winemaker Gianluca Bisol focused his winning proposal on reviving the Veneto’s native Dorona grape, which hadn’t been used to make wine commercially since the Renaissance. Design: Bisol converted the old manor house into a simple, lovely wood-beamed inn filled with Venetian antiques. Some of the A-frame rooms feel like they’re in a tree house. Wine Revival: Bisol sourced 90 Dorona vines from several of the 100-odd islands in the Venetian lagoon. He just released 400 cases of his very first vintage of the nutty, golden wine; the only way to taste it is to visit the Venissa estate.